Brenton is 18 years old and is Vice-Captain at Glenallen School Glen Waverly. 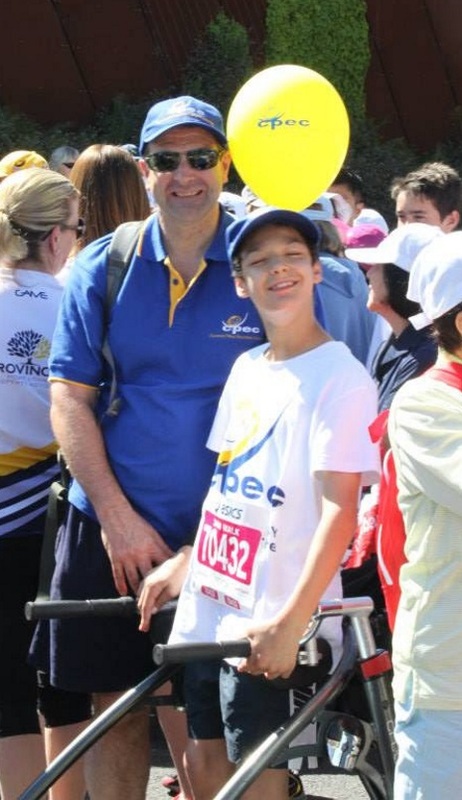 He also attends the Cerebral Palsy Education Centre in Glen Waverley. He is an enthusiastic participant in a number of sports including running, swimming, bowling and hockey. 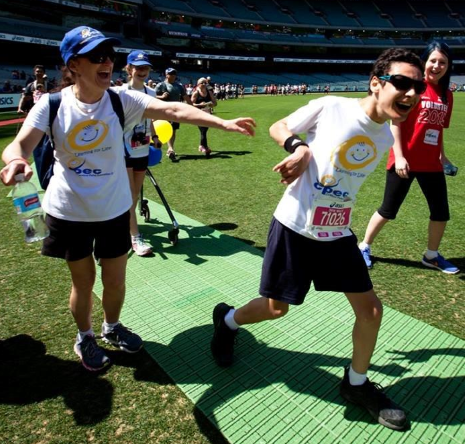 2016 will be the tenth time he has completed one of the shorter events associated with the Melbourne Marathon Festival. He was honoured for this at the 2016 Annual General Meeting. Brenton also features in this video. 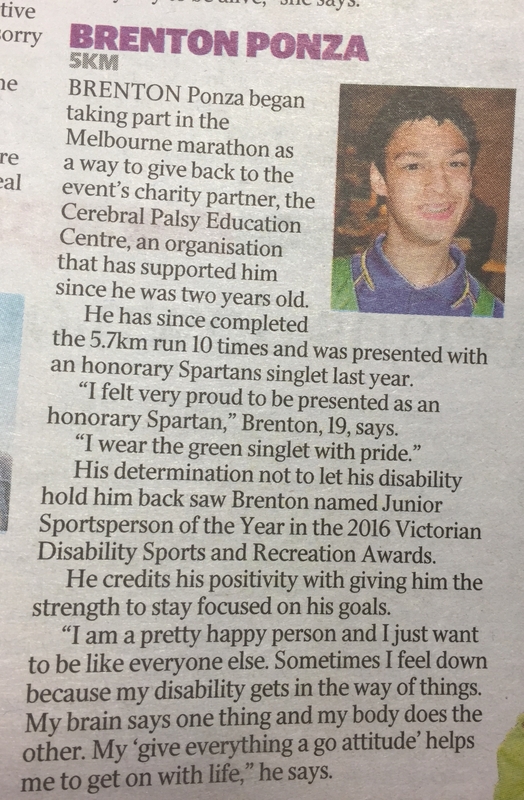 On Saturday, 19 August 2017, the Herald Sun published a supplement on the 2017 marathon which included an article on Brenton. A group photo of CPEC participants before the 2010 event. Brenton is standing second from right in the middle row. His sister Vanessa is to his right. Spartans in the picture are Jane Sturzaker, Judy Wines, Grayson Summers, John Dobson and Peter Battrick. 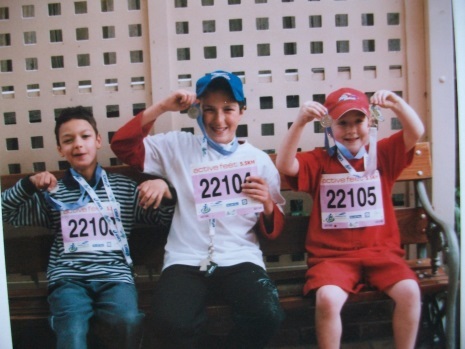 Brenton with brother Matthew and sister Vanessa showing their finishing medals in 2007. 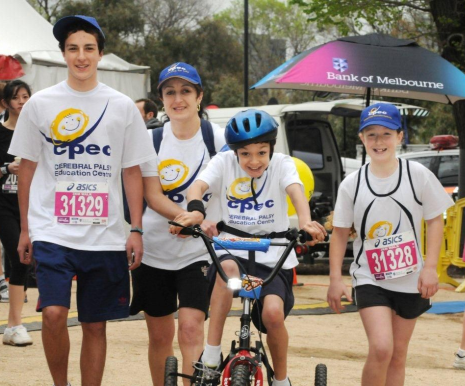 The picture at right of Brenton collecting donations is a reminder that CPEC is the official charity of the Melbourne Marathon. Follow this link if you’d like to donate. 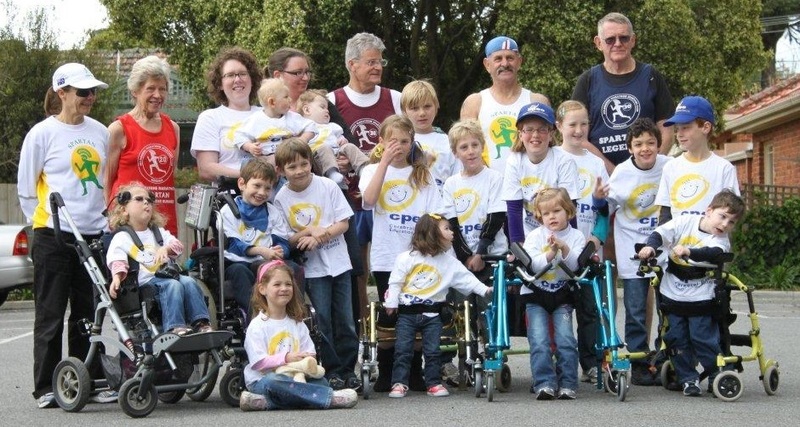 CPEC friends and families support the Marathon Festival by providing volunteers on race day. About a dozen Ponza family and friends man drinks stations arriving at 4am. 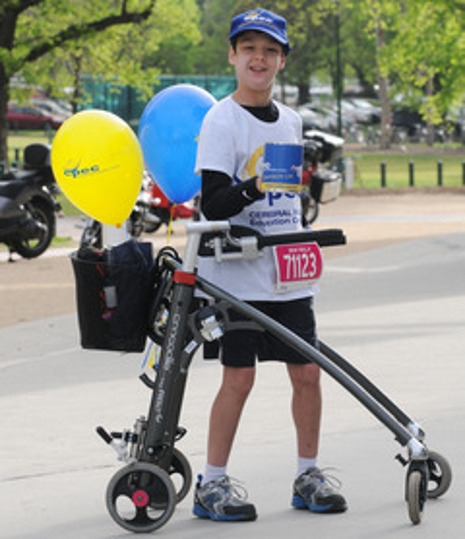 Brenton collecting donations before the 2013 event. Brenton competing in the 2014 event. Brenton with his Dad Elvio. A family affair, 2012: Matthew, Helen, Brenton, and Vanessa. 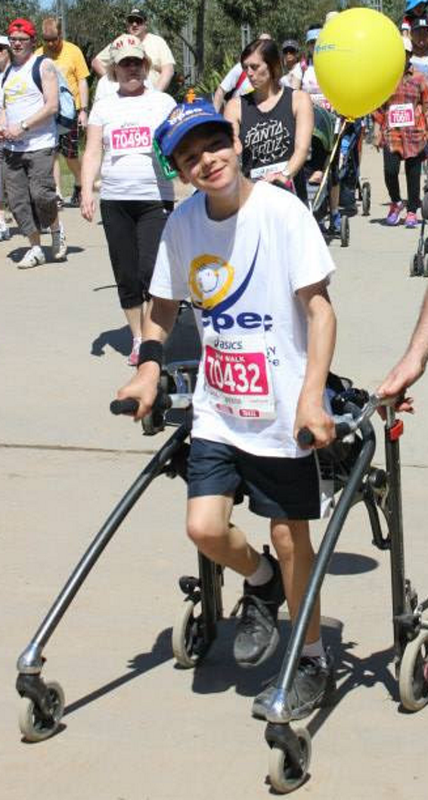 Vanessa has walked with Brenton every year. Finishing on the MCG, 2015. What could be better! 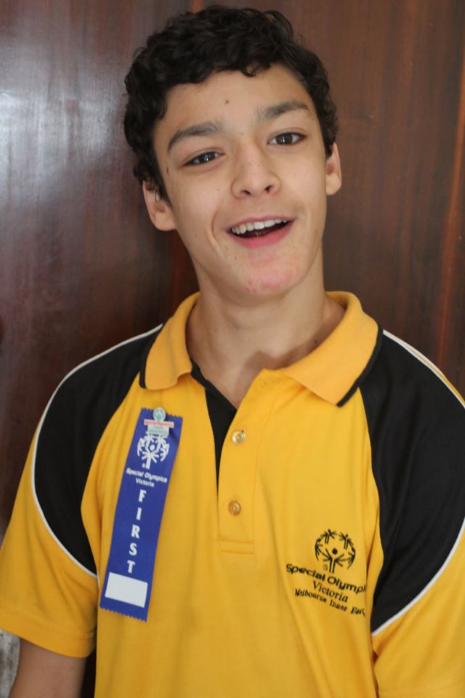 Brenton is a keen ten pin bowler who played in the Special Olympics Regional Bowling Games where he came 1st and won a Blue Ribbon. He has also won a bronze medal at the Special Olympics State Bowling games. Helen says: We are a hockey family and Brenton’s sister Vanessa, who is now 15, was just awarded the Pierre de Coubetin Award by Hockey Victoria for all her efforts in this sport. 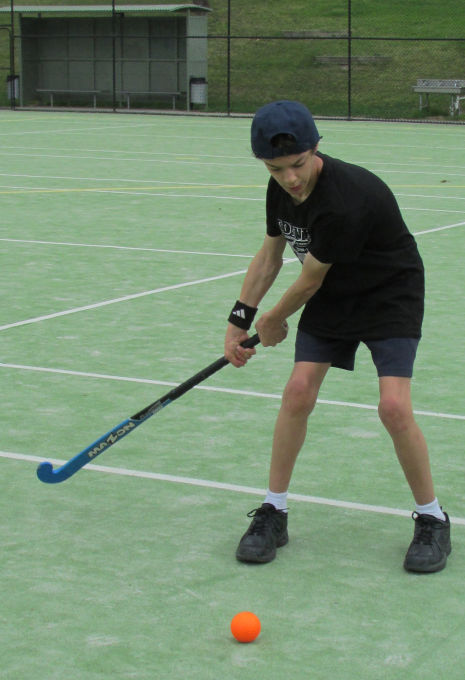 Brenton would love to belong to a hockey team but cannot find one that will accommodate him so he practices when ever he can at Vanessa’s school hockey ground.